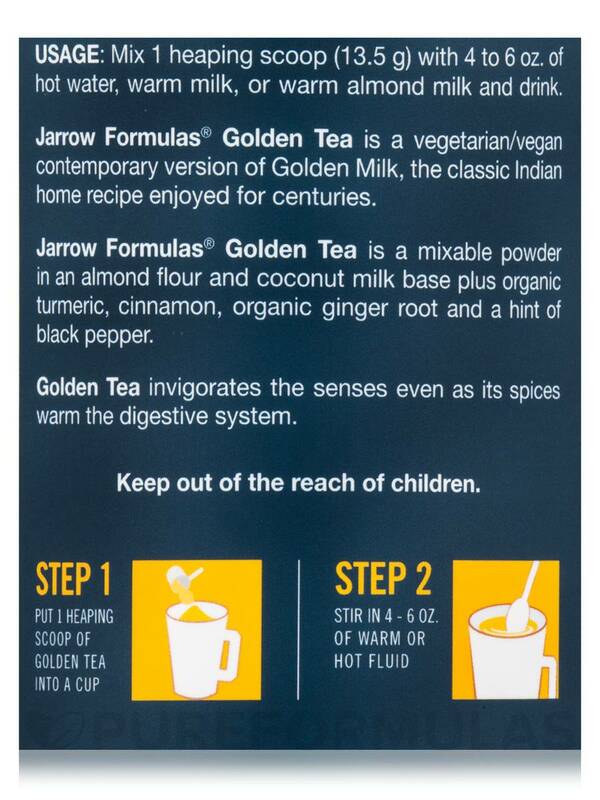 Jarrow Formulas® Golden Tea is a vegetarian/vegan contemporary version of Golden Milk‚ the classic Indian home recipe enjoyed for centuries. 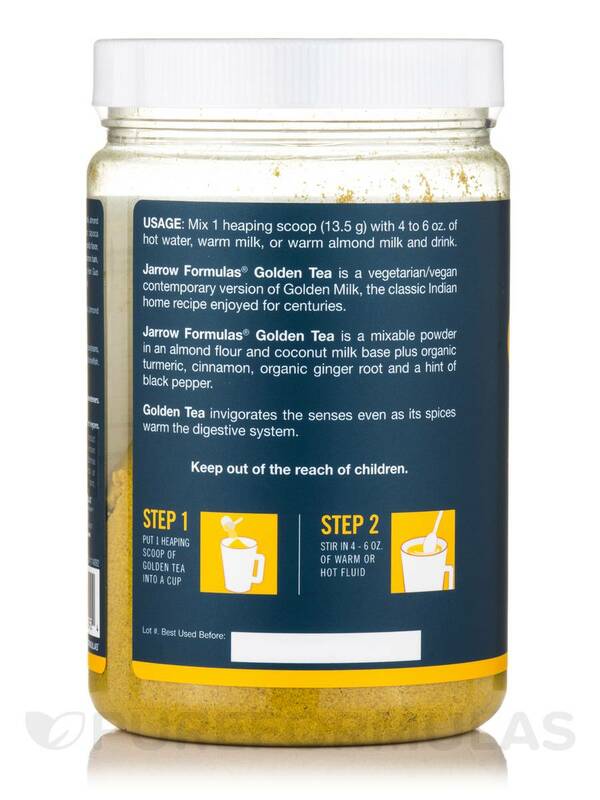 Jarrow Formulas® Golden Tea is a mixable powder in an almond flour and coconut milk base plus organic turmeric‚ cinnamon‚ organic ginger root and a hint of black pepper. 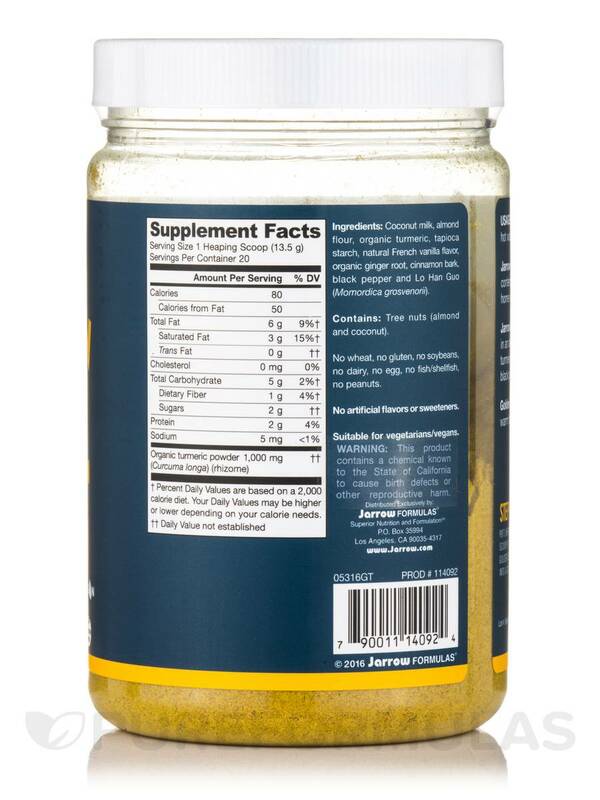 Golden Tea invigorates the senses even as its spices warm the digestive system. Ingredients: Coconut milk‚ almond flour‚ organic turmeric‚ tapioca starch‚ natural french vanilla flavor‚ organic ginger root‚ cinnamon bark‚ black pepper and Lo Han Guo (momordica grosvenorii). Contains Tree Nuts (Almond and Coconut). No wheat‚ gluten‚ soybeans‚ dairy‚ egg‚ fish/shellfish‚ peanuts. Mix 1 heaping scoop (13.5 Grams) with 4 to 6 oz. of hot water‚ warm milk‚ or warm almond milk and drink. 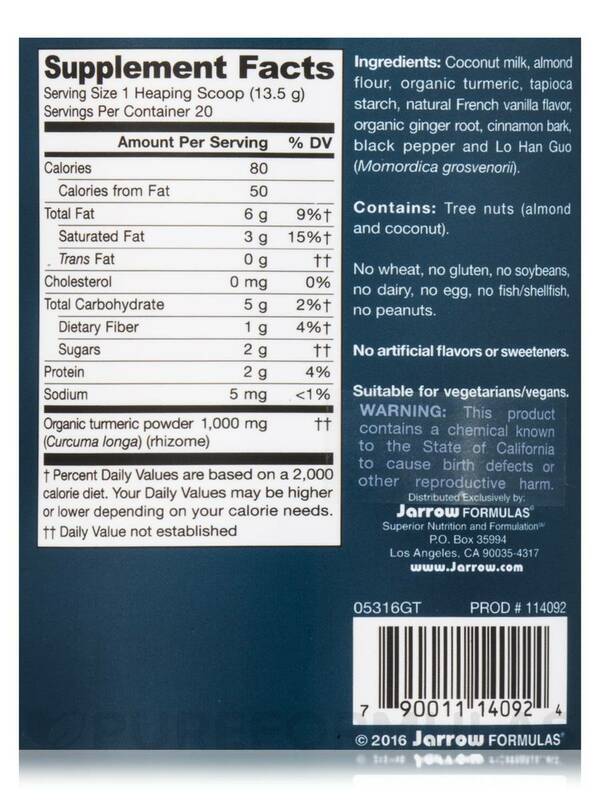 Allergen Caution: Contains Tree Nuts (Almond and Coconut). I mix a scoop of Golden Tea Turmeric Infusion with Warming Spices by Jarrow Formulas with hot water and top it off with flax milk. Warmed coconut milk with Golden Tea Tumeric is delicious and would be good for someone on a Keto diet or for a person who likes a richer drink from higher fats. It mixes well with any warmed milk and it has a sophisticated blend of flavours. The pepper (which supports the turmeric with inflammation relief) makes this a very warming drink that takes away a chill very quickly. It's a good drink for after a winter run or hike. I think it would be a good drink to have around even if a person didn't need it for inflammation issues. It tastes great and it has all the combinations of ingredients suggested by my naturopath. Warming and helps reduce inflammation. 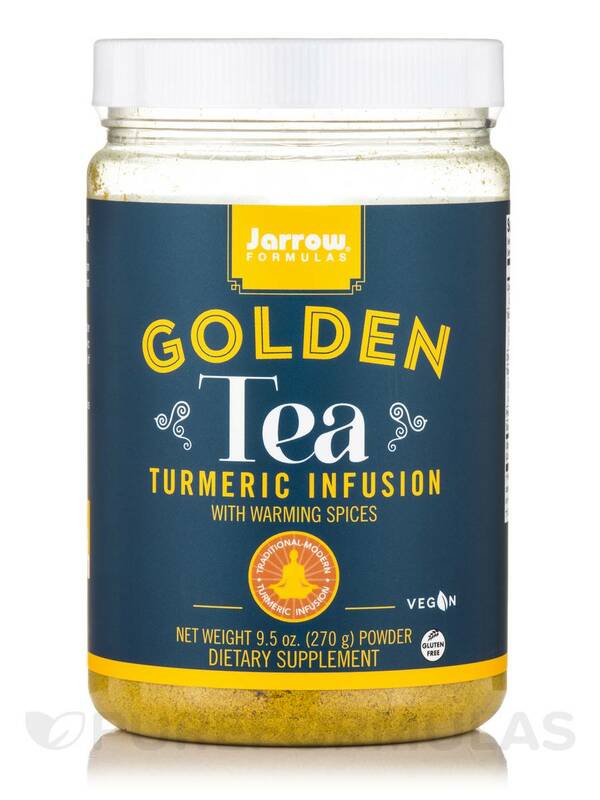 Golden Tea Turmeric Infusion with Warming Spice by Jarrow Formulas is much more flavorful and less "rich" than the sister product Golden Milk, which is dairy-based. The texture is very slightly grittier due to coconut powder, but not a dealbreaker. I use soy, almond or coconut based mills, and find it's nice to add a touch of sweetener like honey to it. The best deal was the price : around $14 whereas it sells in Whole Paycheck for $21. Flavor and the fact that tumeric is anti-inflammatory. Not as dealbreaker but you have to dissolve it well in a bit of hot water and add milk of choice before nuking it. Could be a little finer in texture with a touch of sweetener - though I'm glad they don't sweeten it.